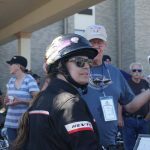 These are the “newer” motorcycles in our collection. Some are classic. Some are not. It’s a question of time where classic ends and new begins. The motorcycles below range in age from 1971 to 1995. All of them we own, or have owned — occasionally trading in or trading up to another machine. 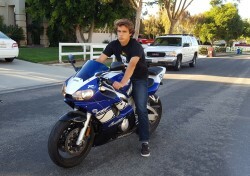 Our son also rides, and he too has traded up to bigger bikes. Each one has a story to tell. Great color! 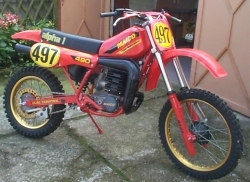 This is the street legal version of the Maico. It has a single cylinder rotary valve engine. The double exhaust only came on the 250. 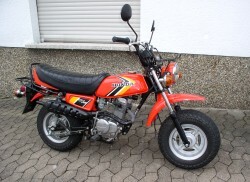 This was bought in the USA and restored for a friend who lives in Prüm, Germany. It has an air-cooled twin engine with a 4-speed transmission. This ex-Swiss military motorcycle is built around a non-desmo OHC Ducati 350 single motor. 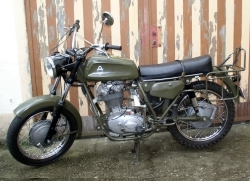 The 350 is the best known Condor in Europe. This is the second of the two MZ Trophys we owned. 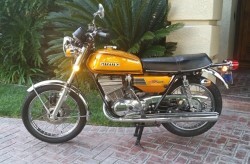 This is a 1971 and is a 150cc. The ES model series was built from 1962 to 1978. Loving that 2-stroke power. 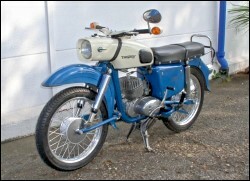 The Suzuki has an air-cooled 543cc inline-3 with 50 hp. Smooth ride. 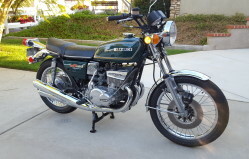 We bought this Suzuki first, and while it is a cool 2-stroke, we like having more power. 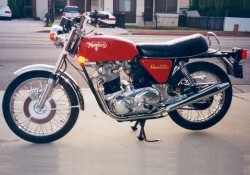 Specs: air-cooled aluminum 247cc parallel twin, with 31 hp. The successor to the Honda DAX. 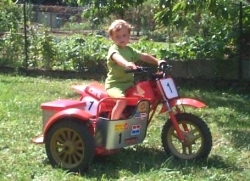 It has an air-cooled single cylinder 50cc motor, which we replaced with a 75cc motor. Great little ride. A garage find from a friend. Ziggy restored it to its original look. It’s not a powerful or special motorcycle, but it was a every kid’s dream in 1970. 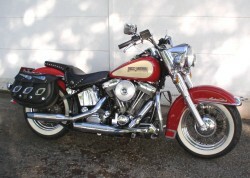 It is a great-looking touring bike with a V2 4-stroke and 1340cc. We took ours over 7,000 kilometers from Germany to the south of Spain. Our son’s latest ride. It has an in-line four, four-stroke motor with 120 HP, and a 6-speed transmission. 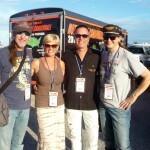 Keep the rubber side down! We bought this 916 from a woman. 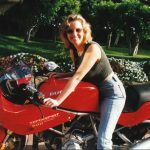 She was trading up to a Ducati Panigale! Now that’s a need for speed. 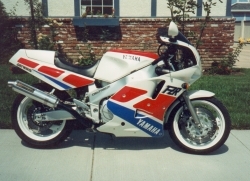 The 916 has become a classic and is one of the most beautiful bikes ever produced. 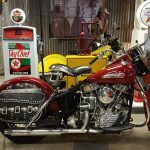 This was Brandon’s first motorcycle. At 3 he could ride it. At 5 we took the side car off. At age 10 he had a Honda 100, and now at 18 he has a Honda 250 — five times the machine he started with. We bought this directly from the German Bundeswehr. You don’t see the K-180 versions often. 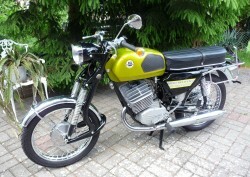 It has the single cylinder 2-stroke Sachs motor. 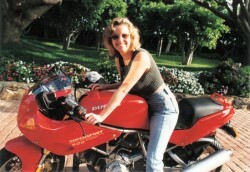 This was Lisa’s 1st motorcycle. 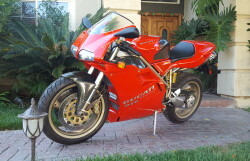 The Ducati 900 has a V2 four-stroke engine with 80 HP. Awesome Ducati sound. As clean as the day it was new. 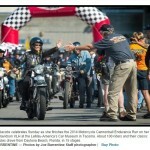 Beautiful, fast motorcycle with 145 HP and a top speed of nearly 170mph. This is a 488cc motocross bike. Ziggy used to race it in the mid eighties in the desert. 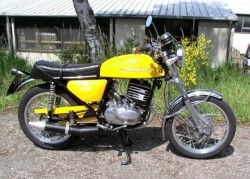 It is a single-cylinder two-stroke… a beast! 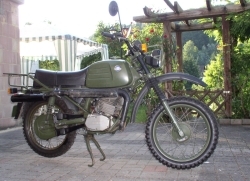 This is a 350cc touring bike from the Czech Republic. 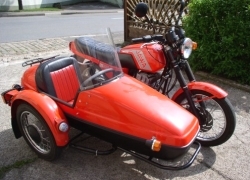 For us, it was a family fun bike, as the kids loved the sidecar. But we sold it.